3.5 stars. A look at Iceland through the lens of the Icelandic sagas with splendid photographs. I expected a modern travel memoir, à la Lonely Planet; instead it intertwines the sagas with the geography of the island. This book and another recent read, Call the Nurse — set in the Scottish Hebrides — remark that these island cultures retain much medieval influence. I know that Iceland works to keep the culture pure. An acquaintance of mine recently married an Icelander and had a baby. They could only name the child from an approved list of Icelandic names. This book is great for those who squirrel random facts away for a rainy day.• Reykjavik from the Old Norse is translated Bay of Smoke (from steaming hot springs)• In Iceland twenty times as many books are published per capita as in the United States.• Geysir, a periodically spouting hot spring in southwestern Iceland, has become the generic name for all waterspouts.• Icelandic is so close to Old Norse that schoolchildren can read medieval classics with ease.• Puffin hunting, a dangerous and occasionally deadly sport, is done with a net on a long pole. The hunter crouches on a steep slope, swinging the net when puffins fly close. If you lose your balance, you fall to the sea. • Egg gathering on the cliff faces is another wild and crazy sport. It involves a stake in the ground, a rope, swinging down the cliff with an apron to hold the eggs. • Icelandic women are considered among the most beautiful on earth.• Christianity became the state religion in 1000 A.D.; however, 92% of Icelanders never read the Bible. 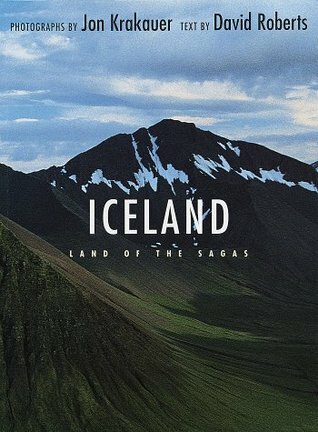 This little book is a great introduction to a mysterious European country: Iceland. I think Iceland is an elusive country for a lot of people, maybe even one that most people don't think often think about. It is a country that I long to visit and I think that my husband and I will get to go at the end of April. Iceland was founded by Vikings but is now a modern, if tiny, European country. For all its modernism, Roberts makes the claim that their historical legacies (largely made up of medieval saga literature, their unique pure bread horses and sheepdogs, and the entire landscape)loom large in Icelanders' self-identity. The book is full of beautiful (if a little grainy) photos of an awesome landscape. Waterfalls, green hills, lava caves, etc. make up this magical, mythical, but very real land. Icelanders to this day believe in trolls and elves, or at the very least, don't deny the possibility of their existence. Roberts does a nice job discussing the different sagas, most written in the 13th century. There are a lot of them and they are riddled with violence, history, curses, the idea that Fate controls the lives of everyone. But they make up the core of cultural memory: even with their literary techniques and imagination, these sagas show the indomitable spirit of the early Icelanders and how they differentiated themselves from other Norse peoples by forging a country out of inhospitable conditions. I picked this up at the library in preparation for an upcoming trip to Iceland, and this made the book particularly enjoyable as a blend of travel guide, history lesson, and mythology. Since we've been planning the trip, I already had a basic understanding of Iceland's geography, and that was helpful - surprisingly, the book does not include a map.The narrative wanders around Iceland in a more-or-less counter-clockwise fashion, starting in the southwest (Reykjavik), which is the same route we're planning. Roberts explains the history and heritage of the island primarily through the Sagas, which provide a strange mix of sober history and obvious myth. The heroes may not have actually wrestled with ghosts and she-trolls, but their existence is certain, at least in some cases. You can still visit the graves of some of these tenth-century legends (and I hope to see one or two in June! ).The book also provides a wealth of interesting tidbits, such as this one: Iceland is the only place in the world whose first human inhabitants were literate - it has no prehistory.I might have to look into some of the Sagas now! The book is a pretty interesting story of iceland. The author takes the reader on a tour of Iceland by way of telling stories of Iceland's sagas, which are stories documenting events of the 10th and 11th centuries in Iceland. As the author moved the reader around the county, the author explains what occurred, or allegedly occurred, in each location, and gives background information on the characters in the sagas. The book is filled with great photographs of Iceland to accompany the text. I generally found the book interesting and liked the layout. My only complaint is that it could at times become difficult to follow as the author moves around the county and in and out of various stories. I think it would be great if the author had a little map of Iceland at the bottom of each page with a star showing the location he was describing. Maybe a note as to which saga he was in would also be helpful. Otherwise, it was a good book! Sagas. Are they real? Are they just stories? An Interesting way to present Iceland to a reader. Trolls and witches and shape shifters are not of the Disney Variety, but dark and violent and accompanied by beautiful photography from Jon Krakauer, makes the reader live the history of this country. This is not a dull history lesson, but a description of a people still using the same language that has never changed. The crazy convoluted struggle to leave pagan ways behind and embrace Christianity, was interesting and so was the chapter on the women of Iceland.....strong and beautiful. I think this history will come alive on my trip to Iceland. Found this mostly helpful in preparation for a trip to Iceland, but, as it was published back in 1990, much has changed. I did enjoy the summaries of the sagas and their relationship to the geographical features of the landscape, as well as the historical information, which made the tourist sites I visited more meaningful. Still, a map might have helped in referencing the areas discussed in the text. Actually found this more useful than the Lonely Planet guide to Iceland I bought, which was nearly worthless, the info was so incorrect and/or outdated. Photos really capture the sense of the landscape, including the perpetually grey summer skies. Surprisingly interesting. A decent mix of "history" and travel info. It kind of makes me want to visit Iceland...especially the chapter that waxes semi-poetic about all the beautiful women. DavidRoberts Jon Krakauer - Librarian Note: There is more than one author in the GoodReads database with this name.See this thread for more information. David Roberts is the author of seventeen books on mountaineering, adventure, and the history of the American Southwest. His essays and articles have appeared in National Geographic, National Geographic Adventure, and The Atlantic Monthly, among other publications. He lives in Cambridge, Massachusetts.